Sennheiser has unveiled a new wireless over-the-ear headphone, the PXC 550 Wireless. Designed especially for travellers, the PXC 550 Wireless features Bluetooth 4.0 with NFC pairing, NoiseGard hybrid adaptive noise cancellation, and a rechargeable battery that can run up to 30 hours on a single charge. You can manage your music and tune the sound of the headphones via the companion app, called CapTune. The PXC 550 Wireless carries a price tag of $399 and will be available in mid-July. For travelers seeking the ultimate way to travel, it's time to upgrade to the new Sennheiser PXC 550 Wireless. The new headphones by the audio specialist are designed for the discerning business traveler. A smart travel companion, the PXC 550 Wireless delivers Sennheiser's renowned high-quality sound and up to 30 hours of battery performance in a sleek wireless headphone. A personalized listening experience on the move can be tailored with ease using Sennheiser's companion app, CapTune. Just like the best business travel experience, Sennheiser's new PXC 550 Wireless headphones anticipate the user's every need, letting them travel in supreme wireless comfort and free from distractions. "With the PXC 550 Wireless we have crafted a premium headphone that brings Sennheiser's leadership in high-quality audio to address the travel needs of the most discerning and demanding set of customers," said Dr. Christian Ern, Head of Portfolio Management Select, Sennheiser. "For business travelers, a headset has to be everything from a precision tool for staying connected to the buzz of work life, to an oasis of peace that allows perfect focus. And when savoring precious leisure time, those accustomed to demanding more will accept nothing short of brilliant audio quality. With the PXC 550 Wireless there's no need to compromise when on the move." The PXC 550 Wireless is built to meet the demands of the frequent traveler with long-haul battery performance of up to 30 hours. Even with the NoiseGard hybrid adaptive noise cancellation engaged, the PXC 550 Wireless can span the world on a single charge. Sennheiser's PXC 550 Wireless offers a smart travel experience that combines supreme ease of use with features that anticipate the needs of the user: The intuitive, earcup-mounted touch control panel and voice prompt system allows for a convenient selection of settings, while the PXC 550 Wireless can automatically pause music and calls when the headphones are taken off. The PXC 550 Wireless features four presets for adjusting sound and one customizable Director mode that can be tailored with ease using Sennheiser's companion app, CapTune. The audio specialist's first sound personalization app has been developed with the discerning headphone user in mind. Free to download for Android and iOS smartphones, CapTune is both a premium quality music player and a powerful sound tuning app that gives users greater sonic control. Permitting precise adjustments with the equalizer and featuring the unique SoundCheck with which users can tune their music's sound by A/B-testing different setups, CapTune allows for a personalized listening experience. The specially developed plug-in for the PXC 550 Wireless also facilitates personalization of adaptive noise cancellation, audio prompts, and the activation of Smart Pause. Staying connected on the move is now even easier, with unrivalled speech clarity for business and personal calls ensured by a beamforming array with three microphones. And no matter how noisy the environment, the PXC 550 Wireless offers crystal-clear speech and gives travelers an ideal private space for relaxing or staying focused on work. Sennheiser's NoiseGard hybrid adaptive noise cancellation ensures uninterrupted listening by seamlessly monitoring and adapting to ambient noise levels - whether on a plane, train or a noisy street - to provide the exact level of suppression needed. Class-leading ergonomics, lightweight design and high-quality materials make the sleek PXC 550 Wireless extremely comfortable even for the longest of listening sessions. Its earpads have been designed in accordance with Sennheiser's dedicated research into ear shape ergonomics for supreme comfort. And when the journey is done, the fold-flat, collapsible design allows the PXC 550 Wireless to discreetly fold away into the provided travel case. Sennheiser's new PXC 550 Wireless, which is priced at $399 USD, will be available on Sennheiser's online shop and on Amazon as well as globally at Duty Free retailers from mid-July. • Sennheiser Introduces HD 800 S Over-the-Ear Headphones at HomeTheaterReview.com. 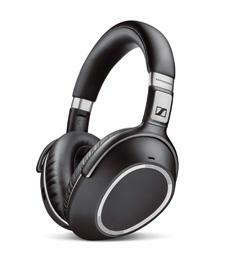 • Sennheiser Announces New Orpheus Headphones at HomeTheaterReview.com.